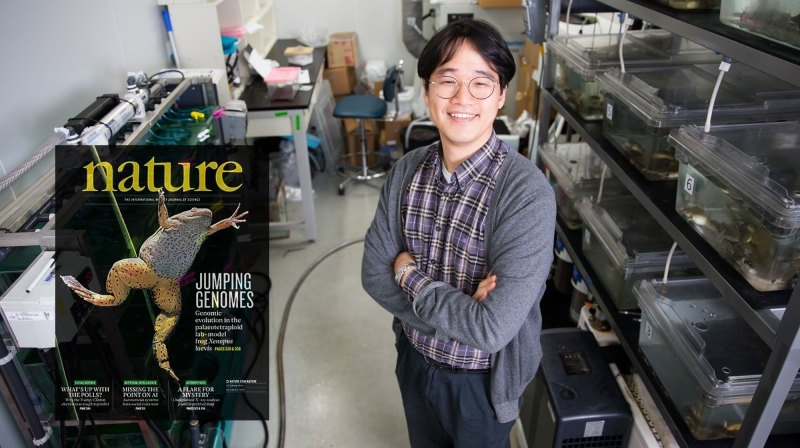 Prof. Taejoon Kwon (School of Life Sciences) is standing in his laboratory at UNIST. Scientists around the world discover how African clawed frogs got extra pair of genes. 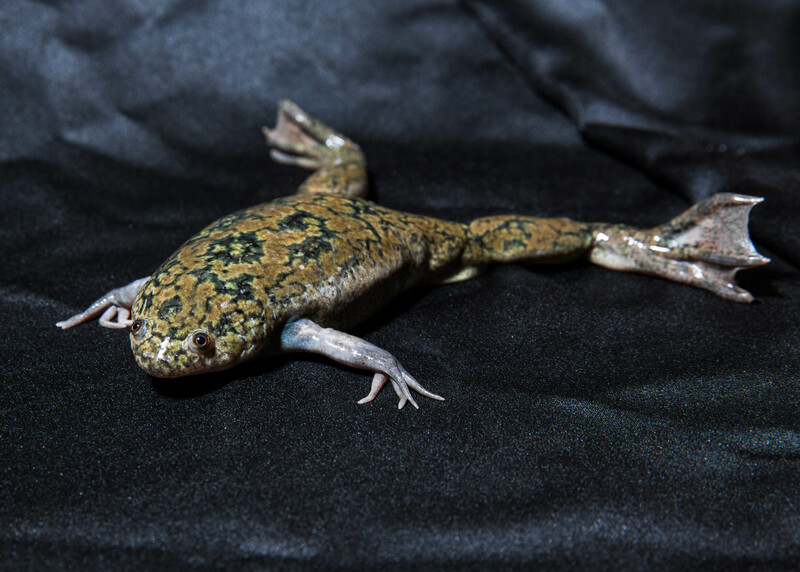 Scientists from around the world, including South Korea, Japan, and United States have, for the first time, decoded the complex genetic makeup of the well-known laboratory animal Xenopus laevis, also known as the African clawed frog. The discovery is an important one, as these amphibians are often used to study the genetic basis of many human diseases, including cancer and congenital abnormalities. 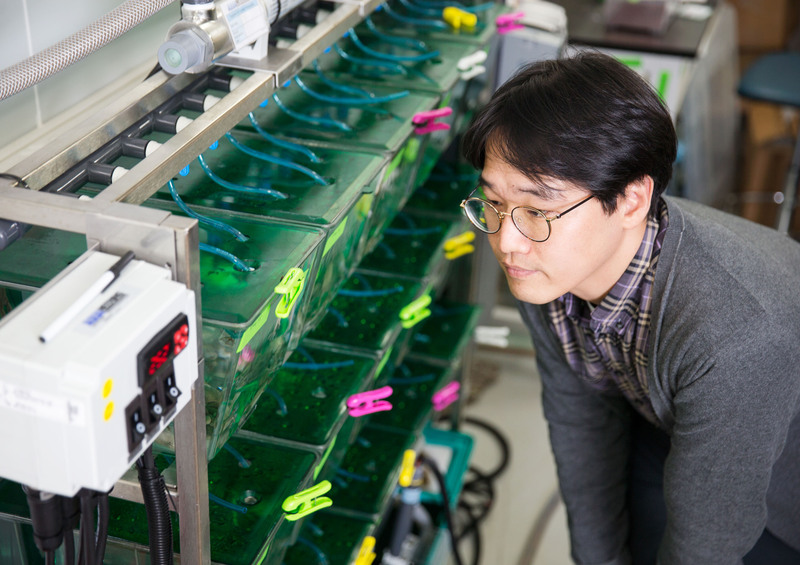 The lead author of the study, Prof. Taejoon Kwon (School of Life Sciences, UNIST) and 74 other researchers representing 46 institutions, published their findings about the genome evolution of the African clawed frog in the prestigious journal Nature. The study has been also featured on the inside front cover of the journal on October 20, 2016. 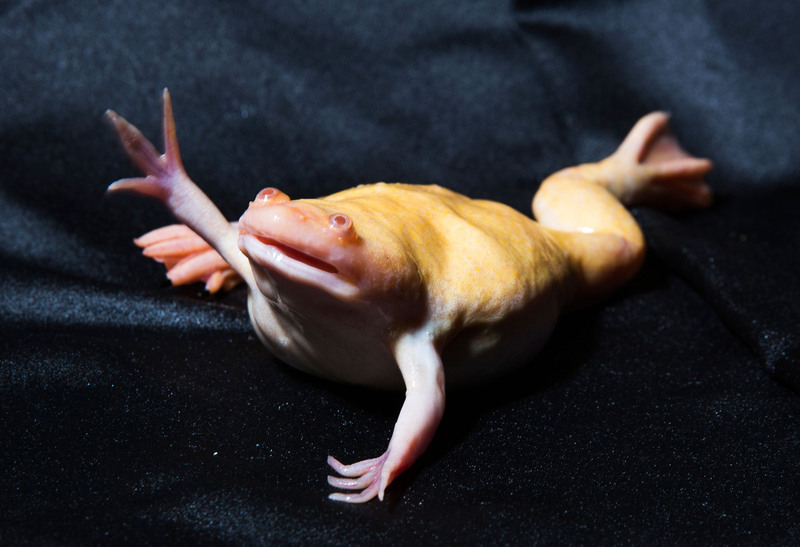 The African clawed frog is a tetraploid species that has four sets of chromosomes, while many organisms, including humans, are diploid and have two sets of chromosomes. One hypothesis is that the genome of two diploid ancestral frogs are somehow merged, giving rise to a tetraploid organism with twice the number of chromosomes as its ancestors. For a century, African clawed frogs have served as a valuable and versatile laboratory model for a variety of basic biology studies. These frogs are easy to study, as their development from fertilized frog eggs to swimming tadpole takes place in the water. Moreover, its ability to lay hundreds of eggs at any time of year, as well as large, robust eggs that can be induced by hormone injection are some of the characteristics that make it an ideal laboratory model. developmental biology, including somatic cell nuclear transfer which granted Sir John Gurdon the Nobel prize. In nature, African clawed frogs live in water. This is the picture of the tetraploid African clawed frog in an aquarium at UNIST. The research team made use of these frogs’ unique composition to sequence its entire genome for the first time, a process that took them seven years. To achieve this feat, they took advantage of new chromatin-related sequencing technologies as well as detailed microscopic examination of chromosomes with fluorescent markers. Although Xenopus laevis is an essential organism for biological and biomedical research, due to the sheer size and complexity of its genome, sequencing the entire genome of Xenopus laevis has been difficult for scientists. The research team notes that the new findings will help our understanding of vertebrate evolution, as the vertebrate genome doubled twice 500 million years ago. 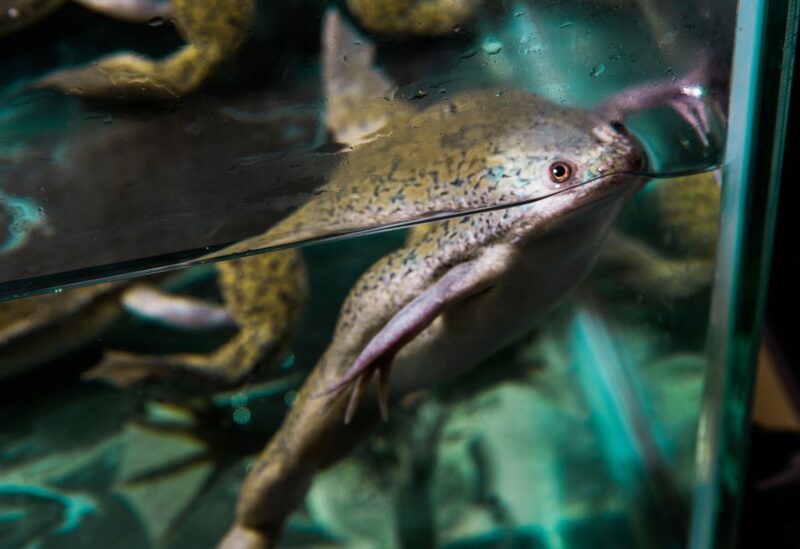 By analyzing and sequencing the African clawed frog genome, the research team discovered a striking pattern of genome duplication in these frogs. They found that the frog’s genome arose through interspecific hybridizations of two now-extinct species between 15 and 20 million years ago. 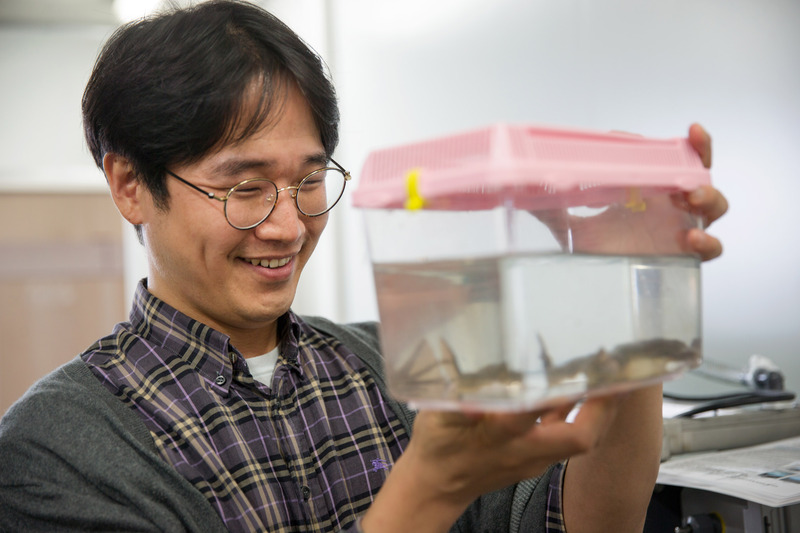 Prof. Taejoon Kwon (School of Life Sciences) is examining his frogs at the husbandry, UNIST. Researchers expect that the discoveries will not only help us understand the evolutionary aspect of vertebrates, but through frog research, also lead to applications in regenerative therapy. 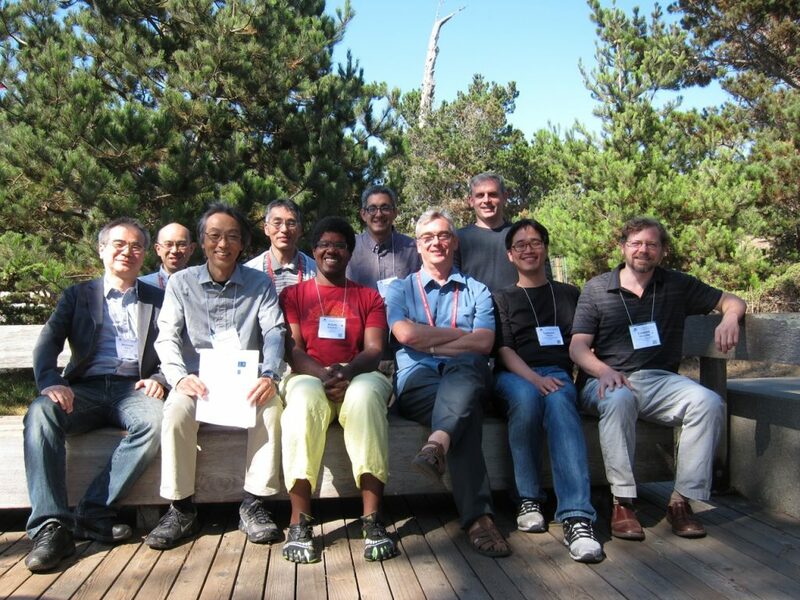 This study has been supported by by the U.S. National Institutes of Health and the Japanese and Dutch governments, as well as the UNIST Research Grant for New Faculty. UNIST is the only institute in South Korea, studying both the African and Western clawed frogs. Prof. Kwon uses these models to study a variety of human diseases, while Prof. Park studies the role genes play in the formation of the face. Adam M. Session, Yoshinobu Uno, Taejoon Kwon, et al., “Genome evolution in the allotetraploid frog Xenopus laevis”, Nature, October 19, 2016.